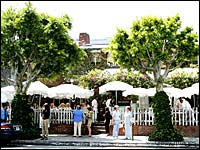 Ivy Entertainment is inviting Ivy industry professionals to an intimate networking dinner at the famous "power scene" Ivy restaurant on Robertson in Beverly Hills. Ivy at the Ivy is an open round-table discussion and networking series for experienced Ivy entertainment professionals to discuss and share insights on rotating topics. The series kicks off this month with the topic: Film Production. Space is limited. The organization is looking for ONE representative from Penn with 3-4 years of Film Production experience to share insights with Ivy peers. How it works: Please email a short one-paragraph bio (+ photo) listing Penn as your school, and describing your Film Production background (min 3-4 yrs experience). Email to kevin@kevinwinston.com by June 14 with "Ivy at the Ivy" as the subject. They are looking for a diverse range of film production experiences. If selected, you will be contacted and receive the background bios of the other invitees to help facilitate an engaging discussion about Film Production in this exclusive networking opportunity.